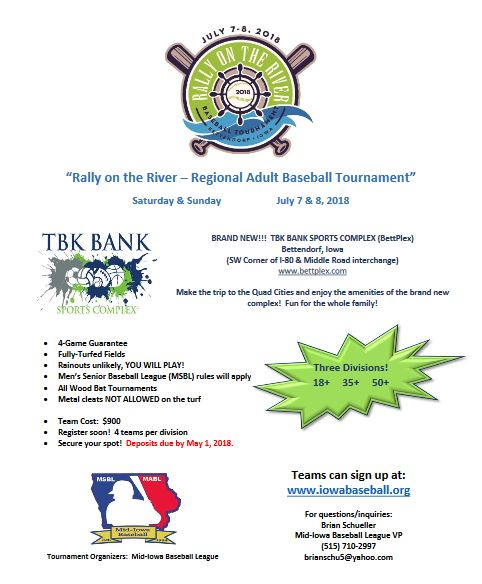 The Mid-Iowa Baseball League has announced a brand new MSBL regional tournament taking place July 7-8 in Bettendorf, Iowa located on the eastern border of Iowa. The ‘Rally on the River’ will take place at the brand new TBK Bank Sports Complex, which features fully turfed fields. MSBL Hall of Fame member and Mid-Iowa league Vice president Brian Schueller is the tournament director. His contact information is posted above on the flyer. Good luck!